SAIF presented its undertaking to continue with skills development, training and education in the foundry industry at a meeting held on 11 June with the dti and the CSIR. At this meeting SAIF also indicated that it will embark on specific projects that is beneficial to the foundry industry at large. The NFTN has allocated R3.1m to SAIF for foundry specific interventions. The motivation for the funding for the modular courses and the AEL Help Desk has been prepared by SAIF and is with the NFTN for consideration at their next EXCO meeting in Sep 2017. Discussions are ongoing with the Ekurhuleni East College Council on how best to allocate the funding that has been allocated by the NFTN to the GFTC. SAIF in partnership with the NFTN has been rolling out the eight module industry skills programme and on-demand short courses to industry. These modules have been well received by industry with a record of 500 learners participating in the programme during 2015/2016. The plan for 2017/2018 is to train 300 learners across South Africa in 3 of the 8 modules within the SAIF Diploma Training Programme. Training commenced in August. Moulding and Moulding Sands: presented at the University of Johannesburg, facilitated by Dr Didier Nyembwe with 24 students registered to attend the course. Casting Design & Methods: presented at the University of Johannesburg, facilitated by Nigel Brain with 36 students registered to attend the course. Productivity and Production Planning: presented at the Premier Hotel in Pinetown and facilitated by Xolani Matsebese with 13 students registered to attend the course. The investigation by SAIF to ascertain the training needs both in the modular format and on-site in the Western Cape has been completed. Some 20 students will begin modular training, hosted by Atlantis Foundry, during Q4/2017. A proposal to manage a Help Desk for foundries, who are struggling with AEL, has been suggested by NFTN to the SAIF. With this proposal, SAIF will take note of the queries of the various foundries and then pass on the information to the NFTN. The NFTN will then resolve to offer assistance to the foundry as required. The NFTN has initiated a project to test foundry sand to motivate that the spent sand is excluded from the classification of “waste” by the Department of Environmental Affairs (DEA). SAIF is of the view that many stakeholders can contribute to this debate and has made an appeal to the NFTN to re-consider its funding proposal for sand testing and to broaden the scope of work. As the voice of the foundry industry, SAIF will be taking a lead in the process to provide input to the DEA on behalf of industry. Genesis Analytics has been appointed by the International Trade Administration Commission (ITAC) to conduct an independent and objective assessment of the economic impacts of the price preference system (PPS) for scrap metal. Genesis Analytics has been requesting data, documents, and information from purchasers and users of scrap (e.g. foundries), sellers of scrap, and other interested parties such as SAIF. It has interviewed interested parties and firms that have used the PPS frequently. SAIF has collaborated with Genesis and will share the report once it is available. During a meeting in May 2017 with Pieter du Plessis the CEO of Atlantis Foundries (Pty) Ltd, SAIF presented its dual vision of positioning itself in skills development, training and education as well as to assist the foundry industry with specific projects that will make the foundries in the country more competitive in the long-run. The CEO was pleased with this fresh energy shown by SAIF and confirmed that he will donate all the foundry’s training equipment to SAIF. SAIF will facilitate the installation of this equipment at the Gauteng Foundry Traning Centre (GFTC). The council of the college has approved a budget to fund the decommissioning, transport, installation and wet commissioning of the equipment at the GFTC. SAIF would like to take this opportunity to thank Atlantis Foundries for its valuable contribution to GFTC and will honour its contribution in an Open Day that the college has planned for early 2018. SAIF had a two-day session with industry experts to have the trade test for Melters approved by the Quality Council for Trades and Occupations (QCTO). It is expected that this long outstanding trade test be in place by June 2018. 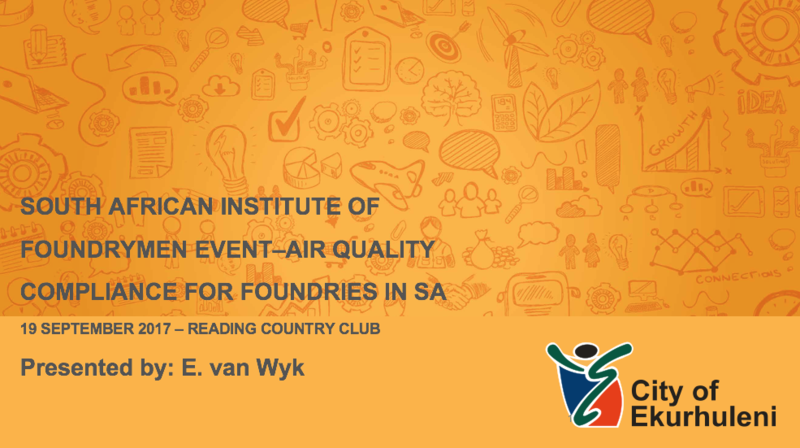 Share news with the local foundries about challenges like import leakage, designation, environmental concerns on air emissions, spent foundry sand, lack of skilled labour and pockets of excellence. Technical presentations form an integral part of SAIF’s objective to network and share information within the foundry industry.In keeping with the SAIF tradition of hosting technical evenings on a monthly basis, we are pleased to announce that the following technical presentations have been ear marked for the remainder of the year. During the SAIF Road Show in July a concerted effort was made to persuade foundries to join SAIF because of the value adding opportunities that SAIF presents to the foundries at large. It is with great pleasure that we welcome Inkunzi Foundry (Pty) Ltd and Pfisterer South Africa from the Kwa-Zulu Natal region as new members. We value their membership and know that it will strengthen the Institute and contribute to its vision of being the voice of the foundry industry. The 2017 Annual Golf Day takes place on 9 November 2017 at the Reading Country Club. This event is an important event on the SAIF calendar and is successful in providing networking opportunities to the foundry industry as well as to raise funds for SAIF. Paid-up members of the Institute are encouraged to book their four ball with the office as soon as possible to avoid disappointment as the slots for this event is quickly filling up. There are also various sponsoring opportunities still available for watering holes, T-boxes and special prizes. Please contact Marina Biljon on 011 559 6455 or email mbiljon@uj.ac.za for further information. Click here for the booking form. The SAIF Board advises members of the resignation of Takalani Madzivhandila (Immediate Past President) effective from 29 August 2017. Trade and Industry Minister Dr Rob Davies reports that a task team has been established to assess how to improve local-content enforcement across government departments and the State-owned companies (SoCs) in line with instruction notes issued by the National Treasury. To read the article click here. © 2019 South African Institute of Foundrymen.